As hard as it may be to believe, we are officially in the fourth quarter of the year. 2018 turned out to be a rather volatile year for the market, with wild moves up and down through most of the year. Luckily, the market has been able to shrug off each sell off, and the major indexes are currently sitting near record highs. Rising interest rates, trade tensions between the U.S. and China, strong oil prices, and geopolitical uncertainty have all contributed in some part to the nervousness we witnessed in the market during the year. All of the above factors still remain, and as such you can expect the market to continue to move higher and lower. Driving the market higher has been strength in the underlying economy, which so far has not felt a huge impact of any of the above factors, but the ongoing trade war with China, and the tariffs that come with the war, do pose a threat to economic growth, and will be the most talked about subject on Wall Street for the foreseeable future. If the economy does start to slow and weaken, the selling could be exaggerated to the downside quickly given the market’s current level. Investors would likely start to unload stocks with big gains and put additional money to work in fixed income assets as interest rates are expected to continue to rise through 2019.
Dividend stocks will be partially shielded from the selling, and stocks with a history of dividend increases will be most shielded. There are only three months left in the year, but there is still plenty of time of the following stocks to extend their streaks of dividend increases before the year ends. 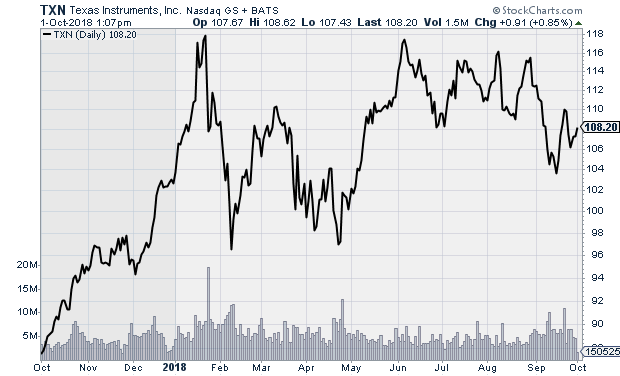 Semiconductor maker Texas Instruments (TXN) has a 14-year streak of dividend increases. The stock has a low 45% payout ratio, so it can easily afford to extend its streak of increases when it announces its next distribution. The sector has been hot in recent years but has definitely cooled off a bit in 2018 on concerns over a trade war between the U.S. and China and the potential impact it will have on demand for the sector. TXN has traded sideways the last five months, but analysts see upside in its future. The stock trades at $108.40 with an average price target of $124.16. The company’s last two increases have been big, and with a 45% payout ratio is can afford another big increase this year. Look for the quarterly distribution to rise from $0.62 to around $0.70 for a 13% increase. Insurance provider Aflac (AFL) is expected to extend its streak of 35 annual dividend increases in October. AFL currently offers a 2.2% yield with a $0.26 quarterly dividend. 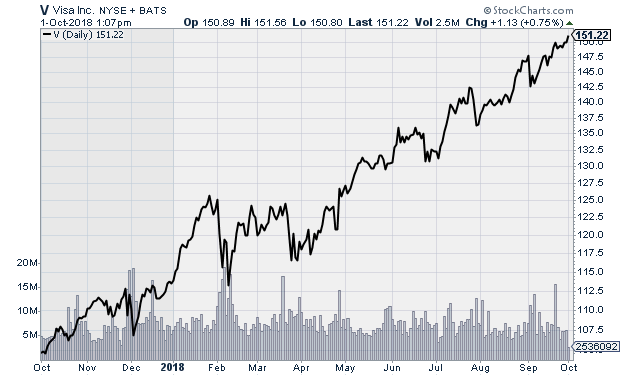 The stock has been strong over the last year, as has most insurance providers. Rising interest rates will boost the bottom line as companies in the sector start to earn more from the premiums they invest in short-term fixed assets. Aflac typically announces its dividend increases during the last week of October, with the stock trading ex-dividend mid-November. Look for the quarterly distribution to rise from $0.26 to around $0.28, for a 7.7% increase. AFL trades at $47.00 with an average price target of $48.00. One of the hottest stocks in 2018 has been credit card company giant Visa (V). A strong economy with low unemployment and strong consumer confidence is driving the stock, and rising interest rates should give the company’s bottom line a nice boost as it will allow the company to raise the rates its charges its customers. Visa has been growing its dividend for the last nine years, and investors are currently earning a 0.56% yield on their holdings. Historically the company has offered low yields, so investors should not expect to see a huge increase this year despite the stock’s low 18.3% payout ratio. Visa is expected to announce its next dividend increase mid-October, with the stock trading ex-dividend mid-November. Look for the quarterly distribution to rise from $0.21 to around $0.225, for a 7% increase. V trades at $151.22 with an average price target of $160.00. 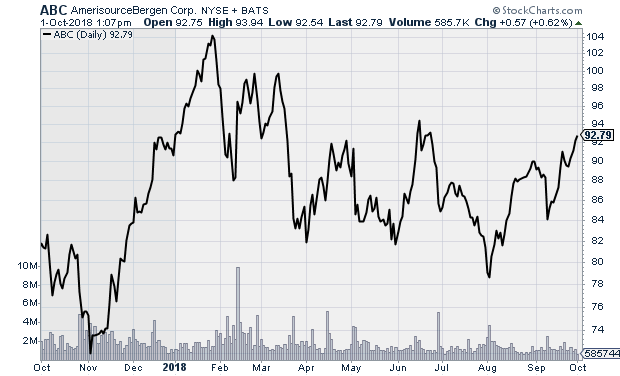 Pharmaceutical products distributor AmerisourceBergen (ABC) has a 13-year streak of dividend increases, and the stock currently offers a 1.64% yield. ABC has been trading sideways over the last six months but is currently trading just below resistance and positioned to break out to the upside. The company will announce its next quarterly distribution during the first week of November, and the stock will trade ex-dividend about a week following the announcement. The company has a low payout ratio of 23.5%, and the stock currently pays a $0.38 dividend. Look for the distribution to climb to $0.40 for a 5.3% increase. ABC trades at $92.90 with an average price target of $96.75. 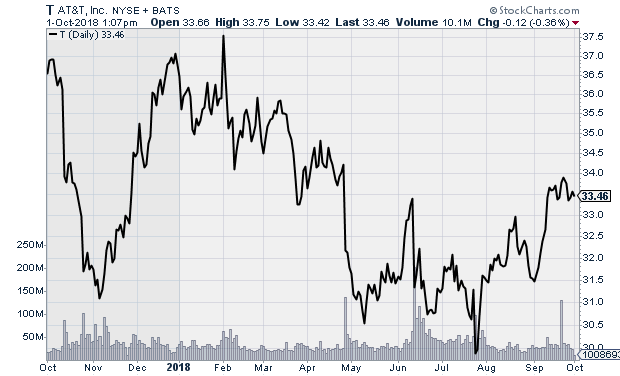 Telecom leader AT&T (T), like most utilities, offers investors a big yield. The stock currently has a 5.9% yield, and the company is a true dividend aristocrat with a 33-year streak of dividend increases. While the company will certainly extend its streak of increases, investors should not expect news of a big increase. Historically the company has lifted its quarterly dividend by a penny, and it will do the same this year. AT&T will announce its next dividend during the last week of September, with the stock trading ex-dividend about a week after the announcement. The company missed estimates in April when it reported its first-quarter numbers but posted mixed Q2 numbers in July with profits beating and revenues missing. 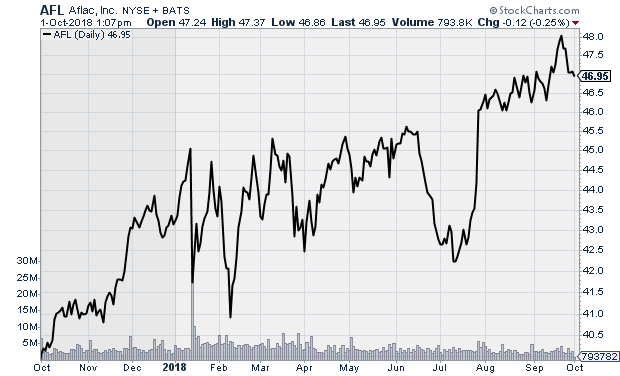 The stock has been trending weakly higher since its July report, and the company will next report on October 7. A strong report will help the stock build on its recent gains. T currently trades at $33.45 with an average price target of $36.55.